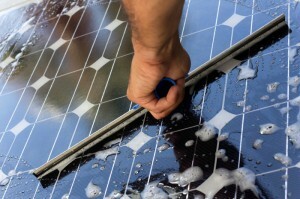 Solar panels are very popular in the San Francisco Bay Area and need to be cleaned. Solar panels consist of solar cells covered by a glass coating and, just like windows, the longer they are outside, the dirtier they get and require cleaning. Although most solar panels are self-cleaning, dust, bird droppings, and other substances build up over time, especially when the panel tilt is minimal or in dry areas. However, getting solar panels cleaned goes far beyond the need to have everything inside and outside the home spotlessly clean. Below are 5 top reasons to make sure your solar panels get cleaned frequently. There are solar panel installation companies and manufacturers that have included the necessity to clean the solar panels in their warranty. This means that you will need to provide proof of regular solar panel cleaning by a local professional cleaning company if you are experiencing any issues with the panels to be covered by the warranty. Unlike what many people think, rain isn’t a satisfying way to clean the solar panels. This is because it contains airborne dust particles that attach to the surface of the solar panels right after the rainwater evaporates. As a result, grime accumulates and forms a film of dirt, which, in turns, reduces the light getting into the solar panels and increases your financial burden. Keeping an eye on your solar panels when up on the roof to clean them (or when you have hired a professional cleaning company to clean them for you) is a great way to check on the inverter display and make sure everything is alright. If the green light is flashing, it’s probably not good (refer to the manual of the product). And, the longer it flashes before you notice it, the more it will probably cost you to bring the solar panels back to their original, excellent condition (malfunctioning panels won’t be able to cover your electricity use). Chances are you won’t be able to figure out what’s wrong with your system, but you have your warranty covering you if you have been meticulous in properly cleaning your solar panels as previously mentioned! Accumulated filth reduces the energy produced by the solar panels. The energy loss is dependent on the level of grime gathered there and can reach 25%-30%, especially of you have never cleaned your system. During a groundbreaking experiment conducted by Google at their own solar farm (1.6 MW) in Mountain View, it became apparent that cleaning their solar panels yearly had doubled their electricity output. If the glass layer that protects the solar cells breaks and water enters into the solar panel, the risk of electrocution is significantly high. You never know what can break that glass unless you frequently get up there to check the condition of the solar panels and clean them regularly. Anything from a bird of prey to a tennis ball can end up on your roof, causing the glass of your solar panels to crack or break. Another avenue for electrocution is birds that peck at wires, which is just another reason why you should not leave your solar panels neglected.